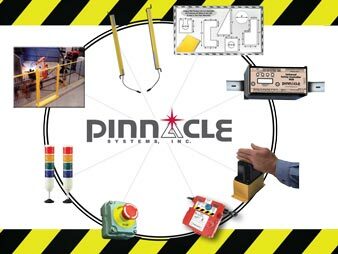 Punch Press Controls | Press Automation Controls | Pinnacle Systems Inc.
Pressroom Electronics is a US manufacturer of safety and automation press controls for metal stamping and forming industrial applications. Products include punch press clutch/brake & automation controls, pneumatic & hydraulic control systems, production monitoring to create OEE and machine safe guarding systems. All products are manufactured, engineered & serviced in the United States. For additional information on the products listed below, please visit the website www.pressroomelectronics.com. Optional 10.1” color touchscreen display is available for all PCS models and replaces the standard display. Requires PressCommander (PCS) with Touchscreen and signature tonnage option. 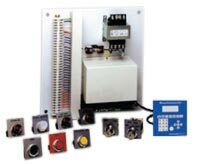 Exceeds OSHA 1910.217 & ANSI B11.1-2009, “Control Reliable Design,” with dual logic power supplies, heavy duty resolver and cable, System diagnostics and programming in plain English/Spanish which can control up to four sets of operator stations, Major faults such as E-Stop, motion, brake monitor, and sensor faults are handled by two force-guided relays (Form B safety relays), Off–inch–single–continuous, Continuous ARM; top stop, anti-tie down and anti-repeat, SPM Range (1 to 500), Password and supervisory controlled keyed selector switch for security of data entry, Interrupted stroke provision with indicator, Inch mode monitoring, Crank angle and speed readout (SPM), Time-based brake monitor, Built-in motion detector and drift fault, 90° and 270° stop time tester/meter built-in, Built-in hour meter for maintenance, Built-in variable speed compensation, Servo-feed interface built-in, Six optically isolated die protection inputs, Six PLS (programmable limit switch) output relays, 100 job memory, Stroke, batch, quality, and part counters, Batch counter output relay, Die protection output relay, Speed output relay, Auxiliary output relay, Optional Ethernet or DeviceNet and PC Link to allow offline job creation and storage. (For Custom Programming & Remote Field Upgrades, please consult factory at service@pressroomelectronics.com or (630) 443-9320.) Optional 10.1” color touchscreen replaces the standard display shown. Touchscreen is shown to the right and includes Production Monitoring. 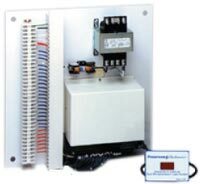 The Board Only PressCommander Module (Part #PCS-05).The redundant clutch/brake punch press control module with a remote panel mount message display (available in English or Spanish). The PCS-08 includes the same options as the PCS-05, but also includes the IEC switches, push buttons and legend plates. Both models comply with section 1910.217 of the Federal Register and ANSI Standard B11.1-2009. 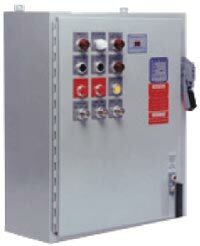 The compact Model PCS-10 is big in safety and automation control. The redundant clutch/brake punch press control module has a remote panel mount message display (available in English or Spanish). Complies with section 1910.217 of the Federal Register and ANSI Standard B11.1-2009. Encompasses all of the features and components of Model PCS-10 plus all of the switches, legend plates, push buttons, and indicator lights for easy mounting into your existing control. Complies with section 1910.217 of the Federal Register and ANSI Standard B11.1-2009. Incorporates all the requirements of OSHA for control reliability and component monitoring. Also includes component and system diagnostics with indicator lights for total press monitoring. When foot actuation is used, a method of guarding the point of operation must be provided. Complies with section 1910.217 of the Federal Register and ANSI Standard B11.1-2009. 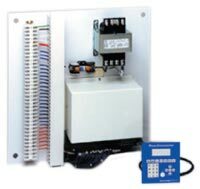 The Model 3200SS (Solid State) Control System is completely prewired and ready for installation. System supplied complete with a well marked terminal strip for easy, safe, and accurate electrical interface to the various punch press components. 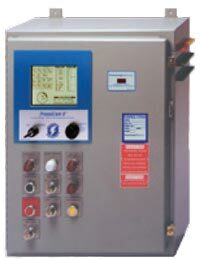 Due to the hybrid design characteristics of the 3200SS, a main power disconnect switch and magnetic motor starters can be supplied in the same control panel. Complies with section 1910.217 of the Federal Register and ANSI Standard B11.1-2009. The Board Only Clutch/Brake Module (Part #SSM-05). The redundant clutch/brake punch press control module with a remote panel mount message display (available in English or Spanish diagnostics). The SSM-08 includes the same options as the SSM-05, but also includes the IEC switches, push buttons and legend plates. Excellent for the Rebuilder or O.E.M. to install onto existing control panel backplate. The Short Stack Module (Part #SSM-10) is Small in Size — Big in Safety and Control. The redundant clutch/brake punch press control module has a remote panel mount message display (available in English or Spanish diagnostics). Complies with section 1910.217 of the Federal Register and ANSI Standard B11.1-2009. 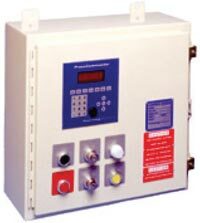 The Short Stack Plus (Part #SSM-20) encompasses all of the features and components of Part #SSM-10 plus all of the switches, legend plates, push buttons, and indicator lights for easy mounting into your existing control panel. The redundant clutch/brake punch press control module has a remote panel mount message display (available in English or Spanish diagnostics). Complies with section 1910.217 of the Federal Register and ANSI Standard B11.1-2009. 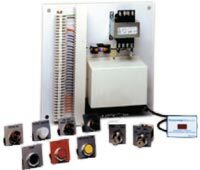 Model 3200SS (Solid State) Control System with Components Included. Mounted in a NEMA 12 (IP 64) steel panel enclosure. Complies with section 1910.217 of the Federal Register and ANSI Standard B11.1-2009. The most feature intensive air clutch punch press control available. The control conforms to all current OSHA and ANSI standards for control reliability and component monitoring. System incorporates the PressCam 8 for complete punch press synchronization and flexibility for all peripheral punch press signaling needs such as feeds, die protection, lubrication, blow-offs, etc. All of the electrical timing adjustments for the complete press operation are done at the floor level by the operator. The PressCam 8 system also has a large job memory of 100. This gives the control the ability to remember 100 complete different jobs or die set-ups at the press. The memory concept at the press is an excellent feature due to the tremendous time saved during set-ups of various operations. Additional time is saved by being able to adjust or “fine tune” the stamping process while the press is running, which is an aid in maximizing press utilization. 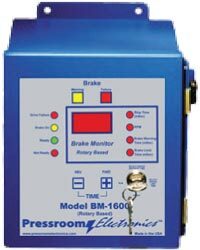 The BM-1600 is a time-based brake monitor that utilizes a high resolution rotary encoder and controller to measure the brake stopping time in milliseconds and also the RPM of the press. The rotary encoder is attached to the subject machine and is driven on a 1:1 ratio by the power press crankshaft. The brake stopping time of the machine will be displayed on every stop and can be easily read on the bright red light emitting diode (LED) display on the front panel of the unit. The RPM/ of the machine will be displayed during the machine cycle. 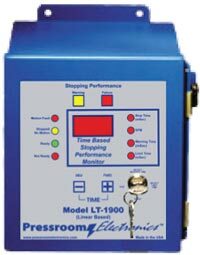 The LT-1900 is a time-based stopping performance monitor that utilizes a high resolution linear transducer and controller to measure the machine stopping time in milliseconds and also the SPM of the press. The linear transducer is attached to the subject machine and is driven on a 1:1 linear ratio by the machine. The machine stopping time of the machine will be displayed on every stop and can be easily read on the bright red light emitting diode (LED) display on the front panel of the unit. The SPM of the machine will be displayed during the machine cycle. 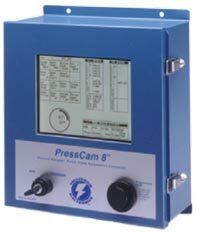 PressCam 8 is a “control reliable” resolver based programmable cam switch (PLS), time-based brake monitor, die protection system, multiple counters, and much more in one package. The system contains two 16-bit computers that are configured to cross check each other and the resolver. The dual computers are interfaced with a full view 8” (203mm) diagonal LCD computer screen for viewing and programming ease. This large operator screen supplies operators and front line supervisors production data without the need of cumbersome menu and program access codes. 100 job memory. 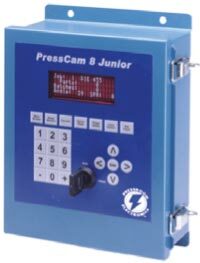 The PressCam 8 Junior is a resolver-based press automation controller that incorporates a programmable cam limit switch (PLS), timed-based brake monitor, servo feed control, four counters, and a die protection system The PressCam 8 Junior is controlled by a 16-bit computer that constantly checks the resolver for accuracy. 100 job memory. The six (6) channel remote die box allows you to quickly change out the die sensors by using either plug connectors or Banana jacks. Provides +24VDC power to active sensors and monitors the status (PNP or NPN). 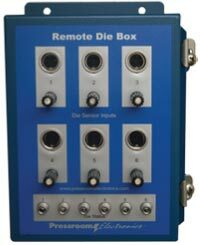 Part number 53-450 six (6) channel Remote Die Box includes individual channel indicators, 45’ quick disconnect cable (12 conductor) minimizes wiring installation time and power supply included to power sensors – 24VDC at 2.5 AMP.